Join Me for a Baby Bash! 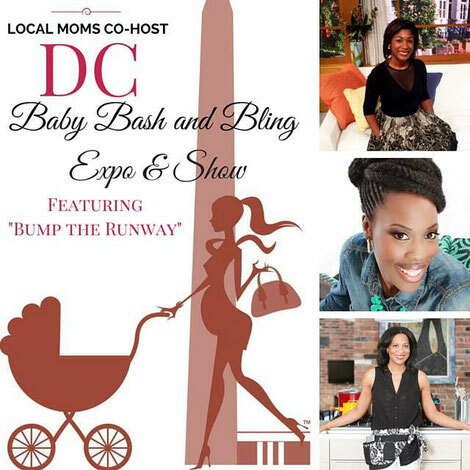 Join me for a fabulous event that embraces glam and mommyhood under one umbrella–Baby Bash & Bling Expo and ‘Bump the Runway’ maternity fashion show! I am cohosting the event this year on Saturday, Oct. 10 from 10:00am-2:00pm at The Loft at 600 F Street NW, Washington, DC 20004, which is located within walking distance of the Verizon Center and several Metro stops. We are excited to welcome as this year's cohost MARKETTE SHEPPARD (@super_markette), host of the new WUSA 9 morning show "Great Day Washington." Markette is also a new mom, beauty maven and entrepreneur of the chic, all-natural beauty e-boutique, Messenger Beauty. She's also been seen on NBC's TODAY show, ABC's Live! with Kelly & Michael and VH1's 'Buzz' morning show. Cohosting along with Markette is Riche Holmes Grant (@bambiniware) creator of Smart + Stylish Baby and Mommy Gear – BambiniWare, a Martha Stewart American Made Brand Partner, Designer + Martha Stewart Contributor and Christine St. Vil (@momsncharge) #FLY Wife & Mom, blogger, speaker, and co-author of Whose Shoes Are You Wearing? Join with our co-hosts for the day as we celebrate moms in Washington, D.C. this fall! The “Bump the Runway”™ fashion show features a collection from Bella Gravida (it's like Rent the Runway for maternity clothing) and Clothed by Ivy Boutique (a fashion forward clothing brand for every day moms), Mommy Branded Apparel from LuLaRoe while showcasing our love for the expecting dad with daddy scrubs from Daddy & Company! Bump the Runway models features LMG Artistry makeup salon and Shear Radiance hair boutique as the Official Glam Squad. The fashion show is produced by Founder & Executive Director of Special Events, Maggy Francois, LLC.